Enabling the latest mobile technology while keeping your organisation’s data safe can be a challenge. 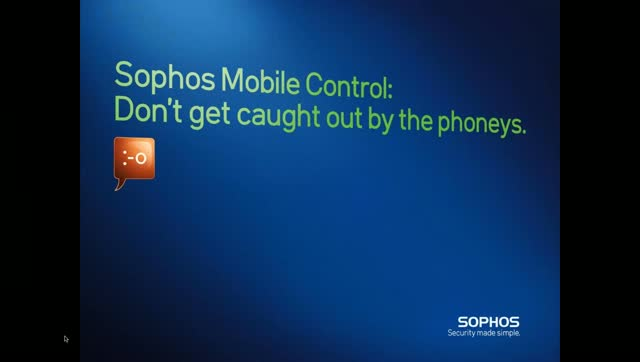 Secure, monitor and control mobile devices with Sophos solutions. The self-service portal makes mobile management easy and stops Bring Your Own Device (BYOD) or Choose your own device (CYOD) from becoming an IT nightmare. This webinar addresses the major mobility challenges for IT managers and their teams and demonstrate effective solutions with Sophos Mobile Control. Social Engineering has been around for as long as the crooks have but in a modern online world, running a con game has never been easier. And that’s why we need to be savvy. A social engineer can research you on Facebook and LinkedIn; read up about your company on its website; and then target you via email, instant messaging, online surveys…and even by phone, for that personal touch. Worse still, many of the aspects of a so-called “targeted attack” like this can be automated, and repeated on colleague after colleague until someone crumbles. Greg Iddon will take you into the murky world of targeted attacks, and show you how to build defences that will prevent one well-meaning employee from giving away the keys to the castle. Peter Craig, Senior Product Specialist, Sophos. Targeted threats using zero-day malware embedded in file downloads and email attachments are increasingly used to attack organizations like yours. Unfortunately these bleeding-edge attacks are often undetectable by traditional anti-virus engines. So what can you do to keep yourself secure? Join us to see why sandboxing is the perfect solution to these advanced threats and despite what you may have heard – IS affordable and simple to use. With over 17 years’ experience in information security, Peter currently specializes in Sophos advanced threat and Web security solutions.